Organic Farmers Market in Hollywood on the Beach? 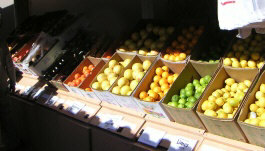 One of the largest farmer's markets that I have been to is the Hollywood Farmer's Market in California. The Hollywood California Farmer's Market is on Sundays from 8am to 1pm. It's located between Ivar and Selma Avenue in Hollywood, California. This is one larger farmer's market and street fair. It contains conventional and some organic foods. 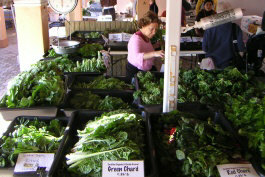 For more information on this farmer's market call 323-463-3171. This article is not about the Hollywood, California farmer's market. This Sunday, I had the pleasure to be in Hollywood, Florida. An unlikely location for an all Organic market. It's open every Sunday between 9am and 5:31pm. While not a typical "farmer's" market with farmers, this market is run by a nice fellow by the name of Josh. You'll hear Josh with his New York accent in the background keeping the market running, directing people to fill the romaine lettuce or run to the truck for some more celery. This market is on the beach, actually right across from it. Its located at Harrison Street and S. Boardwalk (Nearly behind the Ramada Hotel). I was coming from Miami and took Hwy 95 to Hollywood Blvd towards A1A (S Ocean Drive). Park at the Parking Garage at Harrison Street. Once you park, and come out of the Parking Garage, walk down Harrison towards the beach and you have arrived. 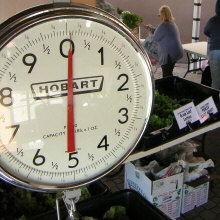 The day I went, it cost $5.00 for the day, but if you get validated at the farmers market, the cost will be reduced by $2.00. Metered parking is available, and meters run 7 days a week in Hollywood from what I heard. Although I did not see any meter maids. Meters cost 25 cents for 15 minutes. Being from California, you could say I'm quite spoiled, with the farm fresh farmer's markets I normally visit to purchase fresh produce. While in Florida, I went to a market on Saturday in Coconut Grove, and I didn't like it all that much. The produce didn't seem that fresh, and the prices were fairly expensive. At Josh's Organic Garden, I was surprised to see some of the fresh produce that was picked the night before. 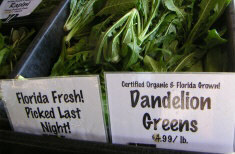 (Things that were picked fresh had signs that read "Florida Fresh! Picked Last Night!). It was so fresh you could taste it.And I did. I had a "Thank God!" when I initially got to the market. The "Thank God!" is a Organic Green Juice made with fresh produce from the market. The juice was made in a Norwalk Style press, but a commercial model. This type of juicer produces some of the best quality juice. Josh cuts no corners. I was also surprised to find out Josh using PLA "plastic cups". PLA plastic is a special kind of plastic made from corn instead of petroleum, so it's compostable. Be sure to say hi to Justin who works in the Juice Bar. They also make fresh smoothies and serve up young Thai coconuts and durian at the juice bar. On this day, I arrived at Josh's Organic Garden at about 10am. I like to get to markets early, since the best selection can be found early. I usually walk the entire market and inspect all the produce and prices. I look for the most economical and most vibrant looking produce, along with items on my shopping list. I ended up hanging out at the beach, took a walk down the beach, and hung out at the market talking to some friends. I would highly recommend getting to the market as soon as you can and buy your produce early, as some produce is limited in quantity. I can say that by the end of the day, Josh had run out of certain items. On this day, the apples, oranges, and tangerines were out by the end of the day, as well as some other produce items, such as heirloom carrots and certain greens. This day, I ended up purchasing some fresh picked lettuce, spinach, some cucumbers, and tangerines. Josh is a busy guy. I wanted to chat with him, and get the inside scoop on what's the best produce. I knew he knew. He was so busy this day, so we did not get a chance to chat. He had a reporter from the local newspaper doing a story on the market.. He strives to go the extra mile for customers. He even jumped on the cash register to reduce the long line (which does move quite fast) and checked me out! Be sure to also ask for the "corn bags" which are the PLA bags, made out of corn instead of plastic, which are compostable. The normal bags on the rolls are normal plastic bags. 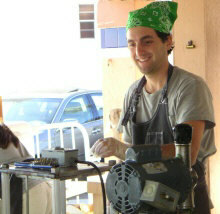 As a raw foodist visiting Florida for a week, I can say Josh was my savior, in getting my fresh produce fix. Thank You Josh for getting this fresh organic produce out to people at affordable prices. For example, the organic bananas at Josh's Organic Garden were 33% less expensive than the Saturday market, and 20% less than Whole Foods. So SAVE some money and get fresh organic produce at Josh's. If you live in the area from Miami to West Palm Beach I would recommend the trip. Call Josh in advance for "case purchases at a discount". It appears that Josh only brings enough produce as he estimates that he will sell that day. The rest?? He donates up to 75% to a local homeless shelter. Josh is a great guy with a big heart. Thank God for Josh. If you get down to Josh's Organic Garden say hi to Josh for me and tell him John from Living-Foods.com sent ya! Call 954-456-3276 for more information.